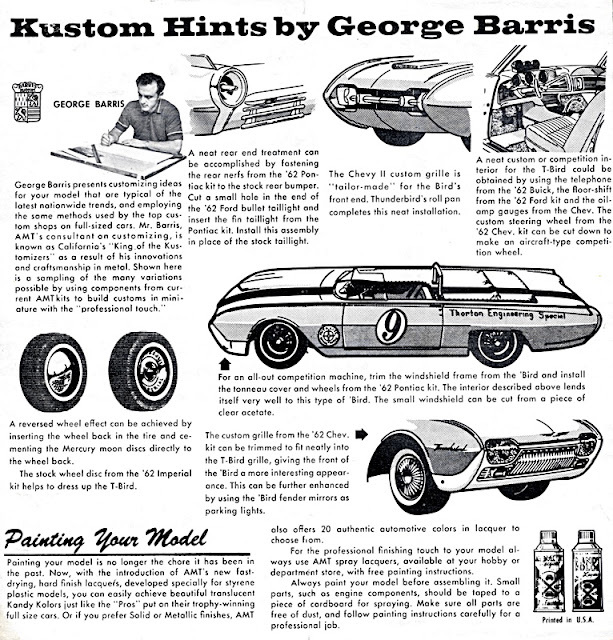 GEORGE BARRIS, PERHAPS THE BEST KNOWN US car customiser - and inspiration for many custom car kits - died on November 5, 2015. Mat Irvine: George Barris was born George Salapatas on November 20, 1925, in Chicago. 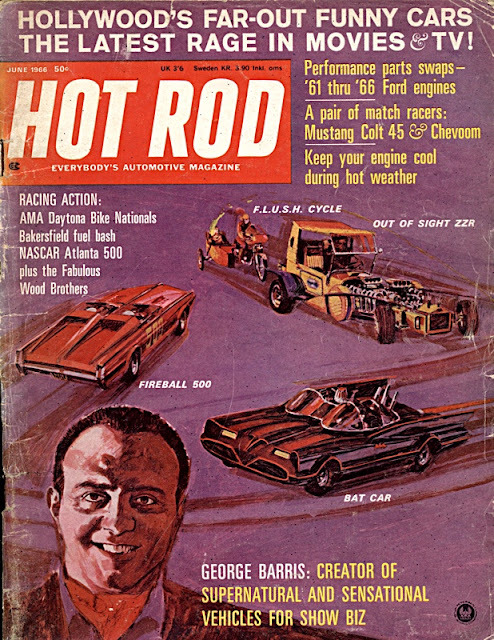 He was from a Greek background, and started a lifelong love of cars at seven years old, building balsa wood models, and winning local model-building contests. 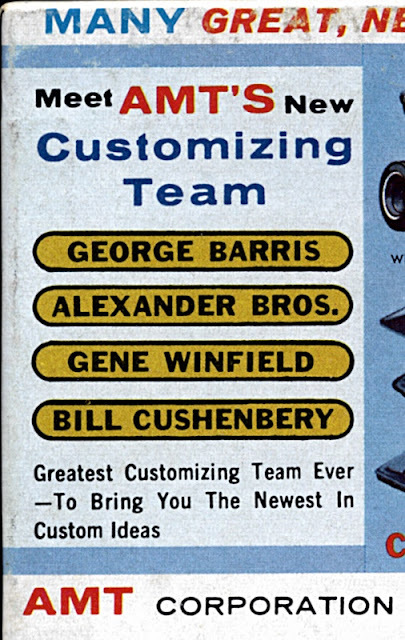 George and his brother Sam, who died in 1967, later started working with full-size car repairs, and also altering their design - which signalled the dawn of the customizing boom. Barris and friend (below) show off the bat-winged X-Pak 400 hovercar. George got involved with TV and movies in the early 1960s, with two of his most famous creations, the Batmobile and the Munster Koach. Around this time, he also got involved with the fledgling model car industry, particularly with the manufacturer AMT. 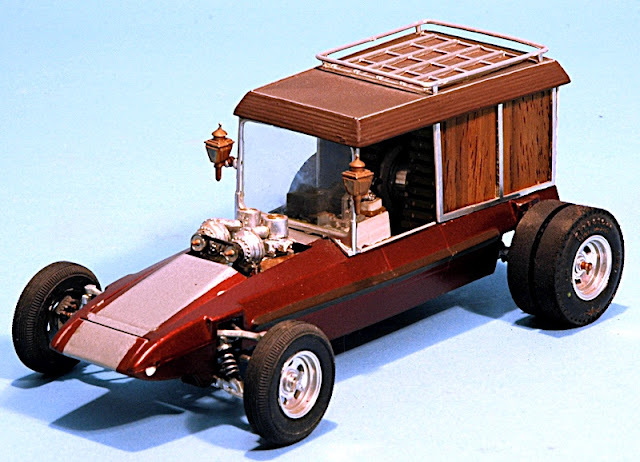 AMT made models of the Munster Koach and Drag-U-La, though not the TV-series Batmobile, which until recently was represented only by a 1:32 Aurora kit. This copy of Hot Rod magazine (below) featured the Barris Surf Woody, posed by the photographer in its natural habitat. 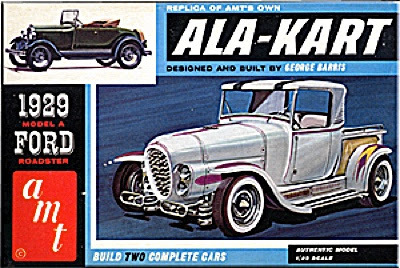 AMT also made two separate kits of a famed non-TV design, the Ala Kart, plus the Surf Woody - my own all-time favourite custom rod. 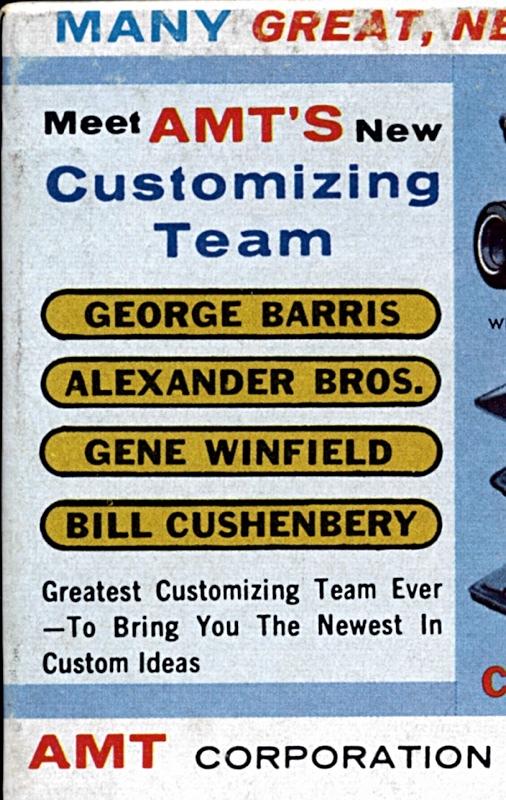 Barris joined the AMT advisory panel, along with other well-known names of the time, such as Bill Cushenbery, Gene Winfield and The Alexander Brothers. Details were added to the end of each instruction sheet, with customizing suggestions that echoed how full-size builders might go about the task. Assembled and finished model (below) of the AMT Surf Woody. 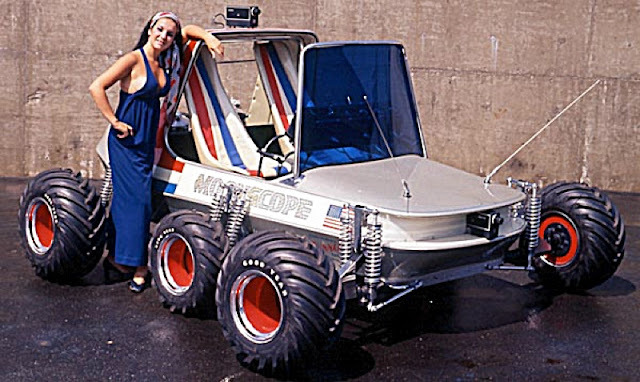 Barris later worked with MPC and Revell, and in the full-size world created vehicles for The Good Guys TV series (MPC), The Beverly Hillbillies (MPC), Knight Rider (MPC), films such as Fireball 500 (AMT), the twin-engined ZZR for the spoof spy movie Out of Sight (AMT) and the cult movie The Car (garage kits). There were also individual cars for Sonny and Cher (AMT) and, another favourite of mine, a customised 1965 Buick Riviera for the movie For Those That Think Young. The Riviera was the AMT Annual kit choice for that year. One of the best known Barris creations, the Munster Koach Number 3 (below) is displayed at the Volo Automobile Museum, Illinois. 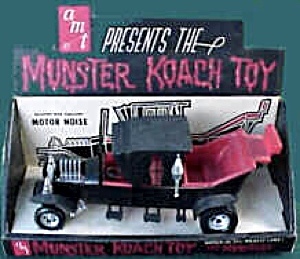 AMT made a larger-scale toy version (below) of the Munster Koach, as well as the kit. Barris Drag-U-La (below) as built for Grandpa Munster. It is displayed at the Volo Museum. The Barris-built TV Batmobile as represented by the new Polar Lights kit (below left) compared to the car it was based on, a Lincoln Futura, here represented by a suitably-painted Revell kit (below right). 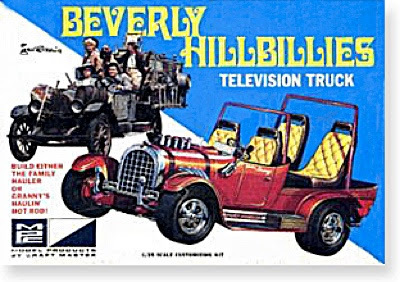 The Barris Ala Kart (below) featured in a AMT double kit, together with its inspiration, a 1929 Ford Model A.
MPC kit (below) of the Beverly Hillbillies Television Truck, based on a 1921 Oldsmobile. The original Beverly Hillbillies Television Truck on display (below) at the Ralph Foster Museum, Missouri. Barris was also involved with practical aspects of car technology, building the X-Pak 400, a one-person hovercraft, the Moonscope electric-powered lunar vehicle (MPC), and the SuperVan rolling laboratory (IMC/Testors). The Supervan also starred in a movie of the same name, George Barris making a brief cameo appearance. The Moonscape (below) was a semi-serious design for a functional lunar vehicle. The original MPC Moonscope kit (below). The SuperVan (below) was originally issued as The Love Machine by IMC, then as the SuperVan by Testors. 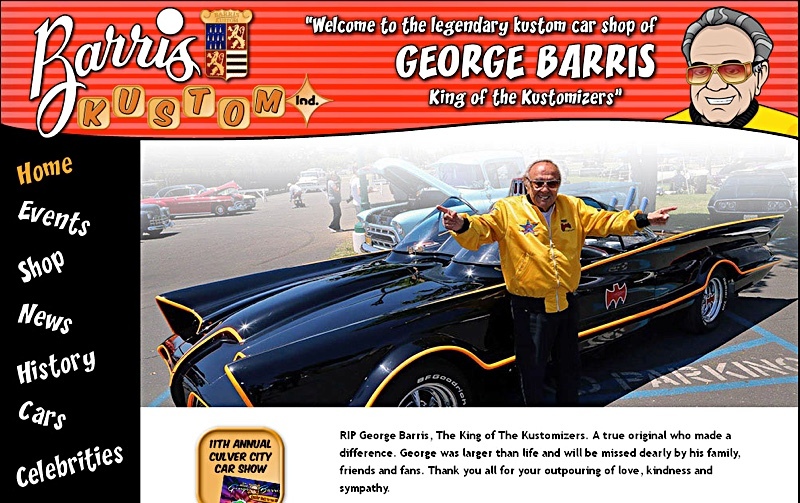 Home page (below) of the George Barris website. 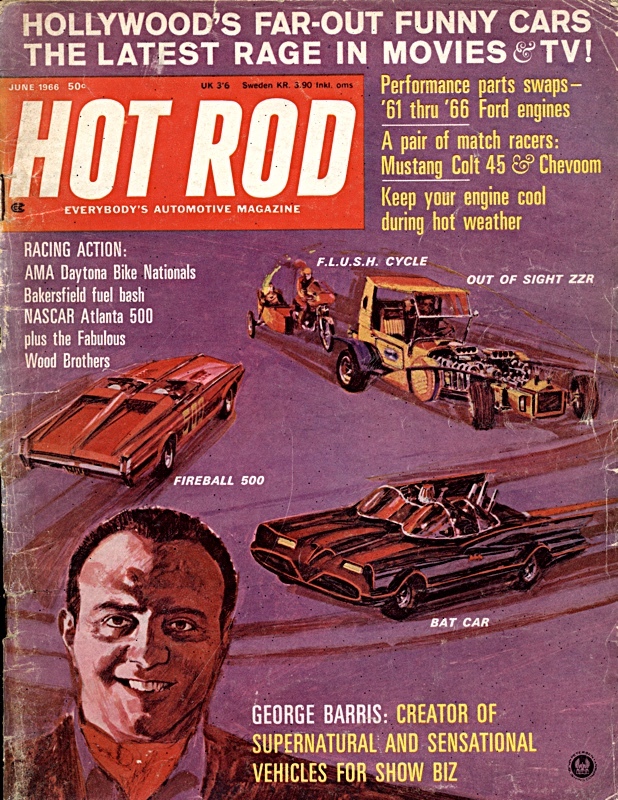 Always a self-publicist, Barris labelled himself ‘King of the Kustomizers’ and was flamboyant and active, attending car shows and signings throughout his long career. Even in the over-the-top world of custom cars, it’s probably true to say that we shall not see his like again. 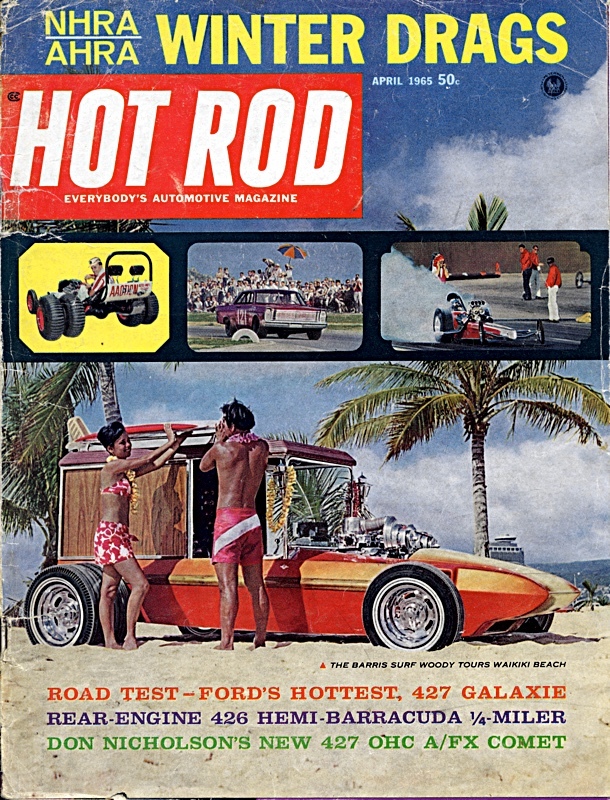 Plenty more on George Barris at Scale Model News here.